I am reading a wonderful new book called Resurrecting Jesus by Adyashanti this morning. He was discussing the Zen koan: “What is the sound of one hand clapping? Curiosity led me to google the Koan bringing me to Serge’s delightful essay. There is a famous Zen koan (philosophical riddle) which asks, “What is the sound of one hand clapping?” The student of Zen is supposed to meditate on this riddle until some degree of insight or enlightenment occurs. The tricky part is that there is no right answer. What you are, or what you know, or what you believe, is what you get. Although no longer an active student of Zen, I was recently meditating of the riddle of one hand clapping when I got an answer that might be useful to share. The sound of one hand clapping is the same as the sound of two hands clapping. How could that be, you ask (for the sake of this article I am assuming that you do ask)? It’s simple, I reply. The concept of clapping implies that a sound is being produced by two surfaces coming into contact, even if only one of them is actually moving. No sound, no clapping; no second surface, no sound. Yet, the riddle definitely states that there is a sound and that there is clapping. Therefore, my answer follows logically. Yes, I know, the answer to a koan is supposed to be beyond logic, but rest assured that the answer came intuitively. The logic came after. Before you dismiss this as simply a bit of cleverness or a waste of time, let me tell you about the rest of the meditation. After the revelation that the sound of one hand clapping must be the same as the sound of two hands clapping, it struck me that this was a nice metaphor for two of the corollaries of the Second Principle of Huna. The basic principle states that there are no limits, which implies that everything is in a relationship to everything else. And that implies that if you change one side of a relationship you change both sides. Even if only one hand changes its position relative to another, unmoving hand , a clapping sound will be produced. We don’t have to wait for both sides of a relationship to participate before bringing about beneficial change. Change one side of that relationship and the other side has to change because the relationship has changed. We use this idea a lot in teaching Huna. For instance, in third-level healing work where we assume that everything is a dream and everything is dreaming, we say that if you change one dream you automatically change all related dreams. So you can go to an imaginary garden and make changes to symbols of your life experience, and your life experience will change. In second-level healing work where we assume that everything is telepathically linked, we say that if you begin to silently bless and forgive people with whom you are having difficulties, they will know it and they will begin to change their behavior toward you without a word being spoken. And in first level healing, where we assume that everything is separate but potentially interactive, we teach that if you smile and hug a lot you will tend to get a lot more smiles and hugs back, even from people who don’t normally smile or hug. Now what do you think would happen if you applied this idea to the whole of your life? In a strained personal relationship, for example, instead of waiting for the other person to make the first move toward reconciliation you could start the process in your own mind, either by purposely creating a better opinion of the other person, or by imagining the two of you getting along with all of your differences. Sorry, you can’t control with your imagination what the other person thinks or does (it simply doesn’t work), but you can use imagined persuasion just as you might in a face to face meeting. As in any form of persuasion, however, the more your persuasion is based on a benefit to the other person, the more successful it is likely to be. In a strained global relationship, assuming our theory is valid (which means workable). we might be able to get together even in a smallish group and and rethink (or redream) our relationship with one or both countries involved. Theoretically, of course, it ought to take only one person to make a change. On the other hand, the change of one person’s relationship to a country might only produce a very small change, so the more people the better. The thing to remember, in this context, is that you are trying to change how you think or feel about the country, not trying to change the country. It’s a subtle but important difference, and it applies to people as well as countries. Timothy Wilken, MD writes: Human intelligence develops over time and can achieve four levels of understanding. We start with PERCEPTION then develop and sometimes master CONCEPTION, then develop and sometimes master MECHANISM and finally develop and sometimes master CONSEQUENCE. These levels are sequential–CONCEPTION follows and depends on first mastering PERCEPTION, MECHANISM follows and depends on first mastering CONCEPTION, and finally CONSEQUENCE follows and depends on first mastering MECHANISM. And finally, CONSEQUENCE is the level of knowing necessary in order to co-Operate — to know why we should never have created nuclear weapons in the first place. Why are we creating these devices? What will be the consequence of their existence? Unfortunately some of humanities greatest mistakes result from acting on our understanding of MECHANISM without considering the CONSEQUENCE of using a newly discovered Mechanism. The following article was first published on September 13, 2013 under the title: Endless Fukushima catastrophe: Many generations’ health at stake from the RT website. The author describes one of humanity’s recent great mistakes. I am re-posting this article not to frighten the reader or to blame anyone, but rather hopefully to attract the best of humanity to help our scientists and engineers address this crisis NOW! Bio-accumulation of radioactive elements around Fukushima will devastate many future Japanese generations, while the Pacific Ocean is also being contaminated by leaking radioactive water. Yet there is still no good solution from the Japanese government. As I watched the tsunami power into the reactor complex at Fukushima on March 11, 2011, I realized the world would never be the same again. No nuclear reactor can withstand being drowned in a massive wave of water without catastrophic consequences. There were three nuclear reactors undergoing fission at the time while one, unit four, had just been emptied of its radioactive core, which was now situated in an unprotected cooling pool on the roof of the building, 100 feet (30 meters) above the ground. As the power supply to the reactors was disrupted during the earthquake, and the auxiliary diesel generators in the basements of the reactors failed because they were flooded, the pumps which supplied up to 1 million gallons of cooling water to each reactor failed. Within hours the intensely hot radioactive cores in units one, two and three started to melt. As they melted, the zirconium metal cladding on the uranium fuel rods reacted with water to produce hydrogen which exploded with overwhelming intensity in the buildings of units one, two, three and four releasing huge amounts of radioactive elements into the air. On March 15 alone, it is estimated that 100 quadrillion Becquerels of cesium, 400 quadrillion of iodine plus 400 quadrillion of inert noble gases (xenon, krypton and argon) escaped. Over a period of time two-and-a-half to three times more noble gases were released into the air than at Chernobyl. Noble gases are very high energy gamma emitters similar to x-rays, which penetrate human bodies externally and, when inhaled, are absorbed from the lungs and stored in fatty tissue exposing nearby organs, including the gonads, to gamma radiation. Cesium and iodine 131 are also gamma and beta emitters which enter the body by inhalation and ingestion. But over 100 other radioactive elements were also released during the weeks and months of the accident and thousands of people were exposed to clouds of radiation. The damaged reactors continue to emit radioactive airborne releases to this day. Luckily the wind was blowing east across the Pacific in the first several days, taking 80 percent of the fallout with it – much of which was deposited in the Pacific Ocean. But around March 15 the wind changed, blowing to the northwest and large areas of Japan, including parts of Tokyo became severely contaminated. Approximately 2 million people are still living in highly contaminated areas in the Fukushima Prefecture and elsewhere, areas so radioactive that similarly-populated areas were quickly evacuated by the Soviets after the Chernobyl accident. At the time of the Fukushima accident an unprecedented quantity of highly radioactive water was also released into the Pacific Ocean. But it hasn’t stopped. TEPCO (Tokyo Electric Power Company) now admits that 300 tons of this water has been leaking into the Pacific every day since the accident 30 months ago and so far 270,000 tons of water has been released. It is becoming apparent that the three molten cores, each weighing 120 to 130 tons have not only melted their way through 6 inches of steel in the reactor vessels, but they now either sit on concrete floors of the severely cracked containment buildings or they have melted their way into the earth itself – this, in nuclear parlance, is called ‘A Melt Through to China Syndrome’. Because the reactor complex was built upon an ancient river bed located at the base of a mountain range, huge quantities of water flowing down from the mountains (1,000 tons daily) are circulating around these highly radioactive cores absorbing large concentrations of radioactive elements. TEPCO constructed a type of concrete dam near the sea front to prevent this radioactive water from entering the sea. But the continuous flow of water built up behind the dam and overflowed into the Pacific Ocean. Each reactor core contains as much radiation as that released by 1,000 Hiroshima-sized bombs and contains more than 200 different radioactive elements, which variously last seconds to millions of years. Water in the bay beside Fukushima is highly contaminated with tritium, which is constantly increasing in concentration and now measures 4,700 Becquerels per liter – the highest level ever recorded in seawater. 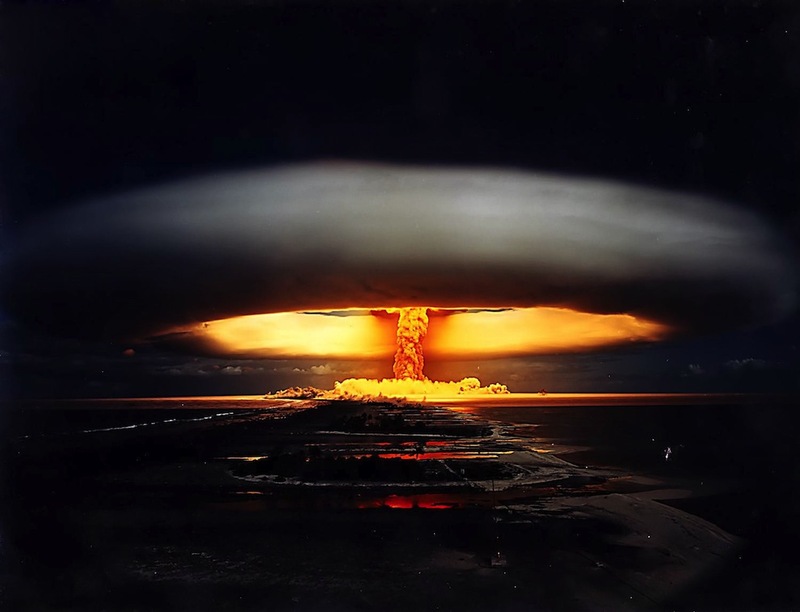 Furthermore a total of 20 to 40 trillion Becquerels of tritium have now been discharged into the Pacific Ocean –a Becquerel is one disintegration of radiation per second. Tritium is radioactive hydrogen, H3. It combines with oxygen to form tritiated water HTO, which is very dangerous. It emits an electron, or beta particle which, if lodged in the body, is very energetic. Tritium combines within the DNA molecule inducing mutations. In numerous animal experiments tritium causes birth defects, cancers of various organs including brain and ovaries, and it induces testicular atrophy and mental retardation at surprisingly low doses. Tritium is organically taken up in food and is concentrated in fish, vegetables, and other food groups, and it remains radioactive for over 120 years. Ingestion of contaminated food causes 10 percent to combine in the human body where it can remain for many years continuously irradiating cells. One of the main elements is cesium, a potassium mimicker, which concentrates in the heart, endocrine organs and muscles where it can induce cardiac irregularities, heart attacks, diabetes, hypothyroidism or thyroid cancer and a very malignant muscle cancer called rhabdomyosarcoma. Cesium remains radioactive for 300 years and concentrates in the food chain. Another very dangerous element is strontium 90, which also is poisonous for 300 years. Analogous to calcium, it concentrates in grass and milk, then relocates into bones, teeth and breast milk where it can cause bone cancer, leukemia or breast cancer. Amongst the many other radioactive elements which are almost certainly escaping into the sea is plutonium which lasts for 240,000 years and is one of the most potent carcinogens known, such that a millionth of a gram can cause cancer. Each reactor core contains 500lbs of plutonium, but Reactor 3 contains even more, because it also contained plutonium/uranium fuel rods which were placed inside the core as an experiment. As plutonium resembles iron in the body, it induces cancers in the lung if inhaled, and also cancers in the liver, bone, testicle and ovary. As an iron analogue, it readily crosses the placenta causing severe birth deformities similar to those produced by the drug thalidomide. All radioactive elements which irradiate the reproductive organs will induce genetic mutations in the sperm and eggs, thereby increasing the incidence of genetic diseases over future generations such as diabetes, cystic fibrosis, hemophilia, hemochromatosis and 6000 others. These are only several of over 100 deadly radioactive poisons polluting the Pacific Ocean and the air, each of which has its own pathway in the food chain and the human body. Radioactive elements are tasteless, odorless and invisible, and it takes many years for cancers and other radiation-related diseases to manifest – five to 80 years for most cancers. Children are 10 to 20 times more sensitive to the carcinogenic effects of radiation than adults, fetuses are thousands of times more so. One x-ray to the pregnant abdomen doubles the likelihood of leukemia in the baby. Females are also more sensitive than men at all ages. Radiation is cumulative, there is no safe dose and each dose received by a person adds to the risk of developing cancer. Of great concern is the fact that 18 cases of childhood thyroid cancer in children under the age of 18 have already been diagnosed and 25 more are suspected in Fukushima. This is a remarkably short incubation time for cancer, indicating that these children almost certainly received a very high dose of iodine 131 plus other carcinogenic radioactive elements that were and are still being inhaled and ingested. Thyroid cancer in Chernobyl victims did not appear for four years. Thyroid cancer is rarely found in young children. Iodine 131 is radioactive for 100 days, and is a potent carcinogen. Iodine 129 on the other hand lasts millions of years. Over 350,000 children still live and go to school in highly radioactive areas, and as juvenile thyroid cancers are arising, so the number of leukemia cases will start to increase about two years from now, with solid cancers of various organs diagnosed about 11 years later. These will increase in frequency for the next 70 -80 years. Food in the contaminated zone will remain radioactive for hundreds of years because it will continue to bio-accumulate radioactive elements from the soil, thus ensuring that an increased incidence of cancer will devastate many future Japanese generations. Medical doctors in Japan are reporting that they have been ordered by their superiors not to tell the patients that their problems are radiation related. Now back to the reactor complex. TEPCO is still pumping hundreds of tons of salt water over molten reactor cores daily as another 1,000 tons of underground water also flows through the damaged reactors. In order to try and control this frightening situation, TEPCO is pumping 300 to 400 tons of this highly contaminated water on a daily basis into 1,060 huge holding tanks adjacent to the reactor complex. These tanks now contain 350,000 tons of water and more tanks are being added each week to accommodate this endless flow of water. TEPCO originally attempted to filter this water using an Advanced Liquid Processing System to remove some of the radioactive contaminants, but one of its tanks corroded and it was closed down in June this year. The tanks have been hastily constructed to last five years, some have rubber seams, others have metal bolts which are corroding and very few are securely welded. 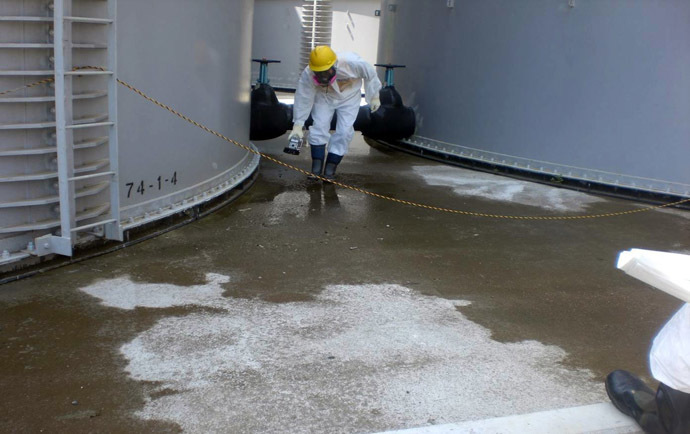 Recently, workers discovered that the highly radioactive water is leaking and contaminating the tank site. Three hundred tons of water escaped from a tank measuring 100 millisieverts, or 10 rems, per hour and some of this water had also drained into the sea. A nuclear worker is allowed a yearly exposure of 5 rems. Because of this finding the present accident level was raised from 1 to 3, the original accident being labeled 7 – equivalent to Chernobyl, and the worst possible case. It is suspected that many more tanks are leaking. Until recently TEPCO had only two men patrolling 1,060 tanks twice a day armed with inadequate Geiger counters. When new instruments were provided, radiation of 1,800 millisieverts per hour, or 180 rems, was discovered in leaked water at another tank, while several days later a reading measuring 2,200 millsieverts, or 220 rems, per hour was discovered! This was estimated to be mostly beta radiation, which would not penetrate the clothing of the workers. However high levels of gamma are radiating continually from the tanks and gamma, like x-rays goes right through a human body unimpeded. The LD 50, a dose at which half an exposed population dies, is 250 rems! Not only are these workers in serious jeopardy, but TEPCO is fast running out of people to manage this disaster which could continue for 100 years or more. TEPCO said tritium levels in water taken from a well close to a number of storage tanks holding irradiated water rose to 64,000 becquerels per liter on Tuesday September 10, from 4,200 becquerels/liter at the same location on Sunday. They are also running out of room to accommodate more tanks, the water keeps coming, and if there is another earthquake measuring 6 or above on the Richter scale, the plastic piping connecting the tanks and the tanks themselves could shatter releasing their contents into the ocean. If an earthquake does not eventuate, what will the Japanese do with this water? Obviously it is going to have to be discharged into the Pacific Ocean. However Prime Minister Abe recently announced that the government will spend $320 million dollars to construct a wall of ice 0.9 miles (1.45km) in length and 100 feet deep behind and around the complex to prevent the mountain aquifer from rushing in to engulf the damaged cores. Arnie Gundersen, a nuclear engineer estimates that trying to clean the site and control the situation would cost at the minimum half a trillion dollars, and he says that the ice wall may not even be deep enough to block the water. Furthermore maintaining the ice wall would require huge amounts of electricity, presumably to be generated by coal as the reactors will all be closed, which will add to global warming and obviously the ice will melt should there be a power outage. Not a good solution as the ice must remain intact for over 100 years. The government also plans to spend $150 million attempting to remove the radioactive elements from the water so they can be discharged into the sea, a Sisyphean task, virtually impossible to conduct successfully. But there are other problems which defy solution. The whole reactor site sits on sodden ground, which has now become unstable, muddy and possibly liquefied. The site itself experiences many minor earthquakes each day, but should a quake greater than 6 or 7 on the Richter scale occur, it is likely that one or several of the buildings could collapse with absolutely disastrous consequences.